The SUPER SIZE tool pallets shown below, measure 17.5” x 14.5”. Super Size Pallets ONLY fit the SXLB/Y, SWLB, WLLB/G, WXLB/G, MLLB, MRLB, MXLB/G and TXL Style Tool Cases! 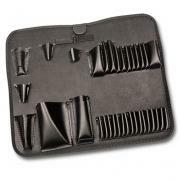 Description: 21 Pocket, Super Size "A" Style Tool Pallet fits in the bottom portion of the tool case. 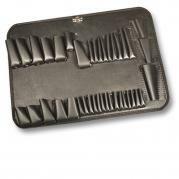 One of our most popular pallets this 21 pocket pallets holds mid- and large-sized tools including pliers and some screwdrivers or other tools. Dimensions 17.5"x 14.5". Tough Neolux Material. 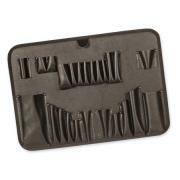 Description: 36 Pocket, Super Size "A" Style Tool Pallet with a small latch for attachment to the top portion of the tool case. 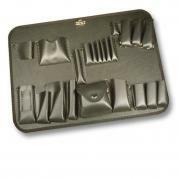 Description: 24 Pocket, Super Size "C" Style Tool Pallet with a small latch for attachment to the top portion of the tool case. 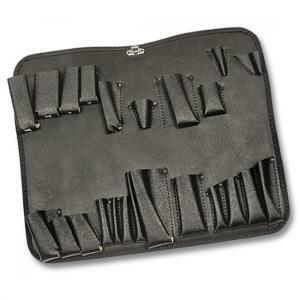 Has 24 medium size pockets hold screwdrivers, pliers and other small and mid-sized tools. 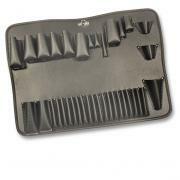 Description: 9 Pocket, Super Size "T" Style Tool Pallet fits in the bottom portion of the tool case. Description: 23 Pocket, Super Size "Q" Style Tool Pallet with a small latch for attachment to the top portion of the tool case. 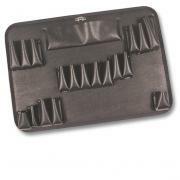 This 23-pocket top pallet has larger screwdriver pockets for cushion grip handle drivers as well as pockets for pliers and other mid-sized hand tools. 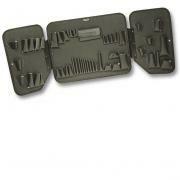 Description: 19 Pocket, Super Size "H" Style Tool Pallet fits in the bottom portion of the tool case. 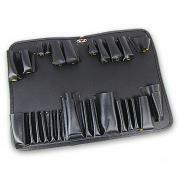 Description: 32 Pocket, Super Size "Q" Style Tool Pallet fits in the bottom portion of the tool case. Has 32 pockets to hold Xcelite interchageable blade sets, pliers and a soldering iron. Description: 39 Pocket, Super Size "K" Style Tool Pallet with a small latch for attachment to the top portion of the tool case. Description: 24 Pocket, Super Size "L" Style Tool Pallet fits in the bottom portion of the tool case. Description: 23 Pocket, Super Size "O" Style Tool Pallet with a small latch for attachment to the top portion of the tool case. Contains 23 medium size pockets to hold screwdrivers, a small tape measure and other mid-size tools. Description: 48 Pocket, Super Size Winged Style Tool Pallet with a small latch for attachment to the top portion of the tool case. Folded Dimensions 17.5"x 14.5". Tough Neolux Material. Description: 19 Pocket, Super Size "E" Style Tool Pallet with a small latch for attachment to the top portion of the tool case. 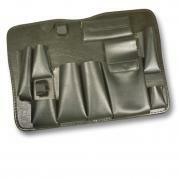 Description: 24 Pocket, Super Size "N" Style Tool Pallet fits in the bottom portion of the tool case. 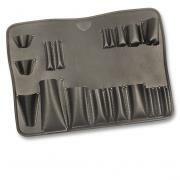 Description: Document Pocket, Super Size "D" Style Tool Pallet with a small latch for attachment to the top portion of the tool case. 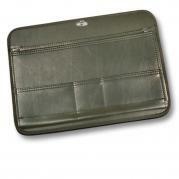 Has two top-loading document pockets with room for papers and manuals and features three smaller pockets for a handheld organizer, CCD-ROM disks and business cards.